Oak wilt is deadly disease that affects all species of oaks (Quercus) found in Minnesota. It is caused by a non-native, invasive fungus (Bretziella fagacearum, formerly Ceratocystis fagacearum). The fungus invades the water-conducting vessels of oaks, eventually killing infected trees. While the oak wilt pathogen can infect all species of oak, those in the red oak group (leaves with pointed lobes) die about two months after infections. Bur oaks die between one and seven years after infection, while white oaks die from one to over 20 years after infection. Oak wilt infection spreads in two ways: above ground by sap beetles, and below ground through roots that have grown together, called root grafts. For more on oak wilt's disease biology and life cycle, see Oak Wilt in Minnesota. Other oak problems can easily be confused with oak wilt. Read more about diagnosing oak wilt in the Identification section. Oak wilt was first discovered in Minnesota around 1950. 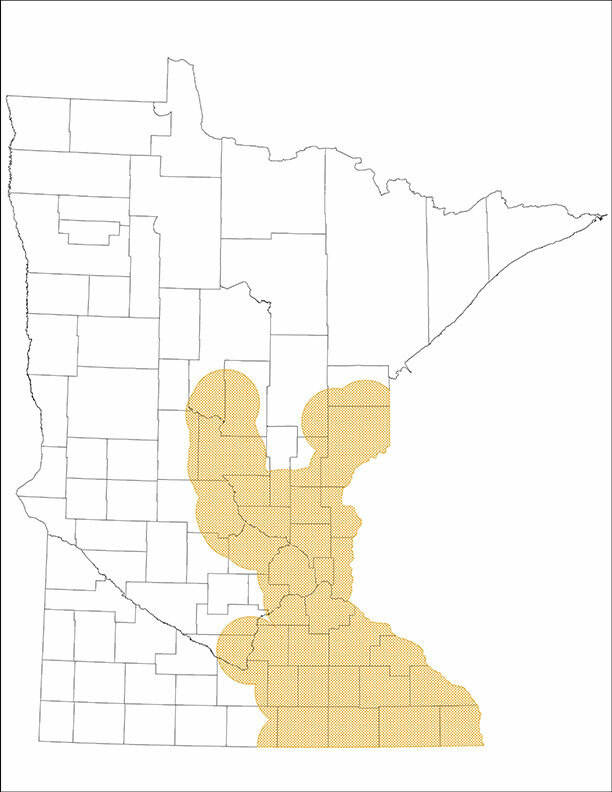 Today oak wilt is widespread in the southern half of Minnesota and continues to expand its range northward. 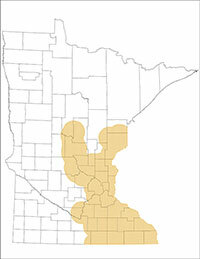 To date, oak wilt covers about one-third of the area where Minnesota oaks grow. The DNR's forest health unit wants to slow the northward progression of oak wilt, and to accomplish this we focus on early detection, advising property owners with at-risk or infected trees, and oak wilt control on public lands at the northern edge of where oak wilt is found. If you see oak wilt outside of the high risk zone, take photos of the tree, record the location, and email that information to your local DNR forest health specialist or DNR forester.